Duck is popular in stateside Chinese restaurants, but this recipe turns it into one of America’s favorite apps—wings. Chef Tran starts with packaged duck wings—now available for foodservice—marinating them in Asian flavors including oyster sauce, ginger, garlic and a little crushed red pepper for heat. Try them instead of the usual chicken wings on the appetizer menu. 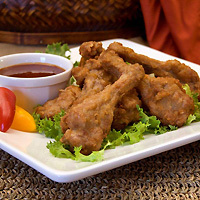 Fry duck wings in deep fryer for 2 1/2 minutes. Keep wings hot while preparing sauce. In a bowl, combine water, oyster sauce, sugar, cornstarch, vinegar and crushed pepper. Mix well and set aside. In saucepan, heat 3 tablespoons vegetable oil, garlic and ginger. Cook until fragrance is released; stir in reserved sauce mixture and cook until thickened. Toss hot wings into sauce and toss until all wings are coated. Garnish with toasted sesame seeds and green onions. Serve.